Army has just tested Hatf VII cruise missile.It has high speed of 880Km/h . It has operational range of about 600-700 Km. 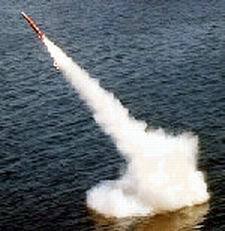 The missile tests are part of a process of validating the system. Babur, which can carry strategic and conventional warheads, has stealth capabilities, is a low flying, terrain hugging missile with high maneuverability, pin point accuracy and radar avoidance. Hatf-VII Babar Land Attack Cruise Missile (LACM) has a maximum range of 750 kilometers km and can carry both conventional and nuclear warhead. Babar Cruise Missile is designed with stealth requirements in mind and with the capability to fly at very low altitude to avoid detection by the enemy radars. The test was witnessed by Chairman Joint Chiefs of Staff Committee, General Khalid Shamim Wynne, Director General Strategic Plans Division, Lieutenant General (retired) Khalid Ahmed Kidwai, Commander Army Strategic Force Command Lieutenant General Jamil Haider, Chairman NESCOM Muhammad Irfan Burney, senior officers from the armed forces and strategic organizations, scientists and engineers. Chairman Joint Chiefs of Staff Committee, officers and scientists witnessed the test. President Asif Ali Zardari and Prime Minister Yousaf Raza Gilani congratulated the scientists and engineers for successfully conducting the test.